With FlexPak TM package leak detection, there are multiple packaging testing methods for your applications to ensure the highest quality in seals, seams, closures and substrates are being met. 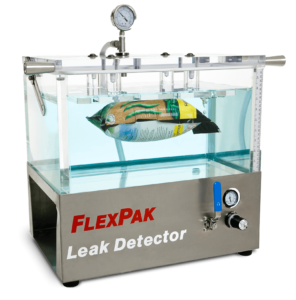 The seal integrity test methods may vary depending on the contents of the package, but the FlexPak TM leak detection system provides all of these testing options with one machine. FlexPak TM vacuum style leak detector can be used to facilitate testing to standards such as ASTM D3078 (Bubble Emission Test, Tightness Test), ASTM D6653 (Altitude Test), ASTM D2096, ASTM D4169, ASTM D4991, and ASTM D5094. Any package integrity test that requires a vacuum chamber, underwater bubble test, or package pressure test can be done with the FlexPak TM seal integrity, vacuum tank, bubble leak detector (with the applicable options). The Bubble Emission leak test procedure (per ASTM Standard Test Method D3078-02) is ideal for packages whose contents have headspace or some amount of air or gas within the package. After placing the package in the FlexPak TM , closing the lid, and submerging it under the water, a vacuum is drawn on the package; if air bubbles appear, then the package is compromised or faulty. Visual knowledge of where the bubble is propagated tells you exactly where the package is faulty and allows you to correct the problem. Leak detectors that do not give a visual location of the problem don’t allow you to fix the problem! This test may also be used for any package to determine a burst point on the seal. The outcome can then be used as a company standard for regular Bubble Emission Tests when in production, and can be tracked during production in order to see a trend in diminishing seal integrity so that adjustments can be made to correct a problem BEFORE it occurs! The Dry Tank Leak Procedure of package leak detection is best suited for packages whose contents are liquid and have little headspace or air within the package. The package is placed in a dry FlexPak TM tank (or chamber) on a paper towel or absorbent-type material. The vacuum is drawn to operator specifications and if after the test finishes, the towel or material is wet, the package seal is faulty. This method is used for packages that are vacuumed sealed (or vacuum packed). For the test, a small attachment is used and the regular Bubble Emission Test procedures are then performed. The special attachment allows atmospheric air into the package in order to allow a bubble to be created should there be a defect in the package. This test is a destructive test. 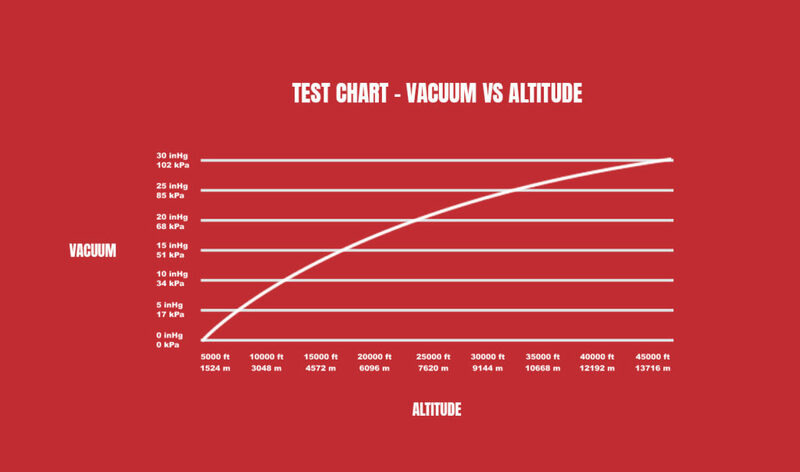 Altitude simulation is important for all goods travelling with varying altitude levels, most commonly air travel or over ground crossing mountain ranges. Upon takeoff and landing, the product will undergo extremes in altitude level. The Altitude Simulation method (per ASTM Standard Test Method D6653) can be performed in either a dry or wet tank (or chamber) depending on package contents through referencing a Vacuum versus Altitude simulation chart.